The solution to change visual effects to best Performance, on Windows 10, this is for Desktop-PCs and Tablet suitable! Please run the command sysdm.cpl about the Run Dialog in Windows 10. For example via Windows-Logo + R Keyboard Shortcut. In the Window 10 System Properties, please select the Tab Advanced. (Image-1) change visual effects on Windows-10! (Image-2) Best Performance for Windows-10! Windows-10 - FAQ-160: On Windows 10, change visual effects to best Performance, how to? How to turn off Animate windows when minimizing and maximizing, in Windows 10? Can I in Windows 10 disable Animations in the taskbar? No fade out menu items after clicking in Windows 10 Explorer? Disable fade or slide menus into view in Windows 10? Disable the fade or slide ToolTips into view for Windows 10? Turn off Smooth edges of screen fonts in Windows 10? How to disable Animate controls and elements inside windows, in Windows 10? Disable in Windows 10 Home or Pro use of drop shadows for icon labels on the desktop? Disable in Windows 10 Smooth-scroll in list boxes? Can I in Windows 10 Enable or disable Peek feature? What visual effects to remove to speed windows 10? Windows 10 system performance visual effects? Visual effects use in windows 10? 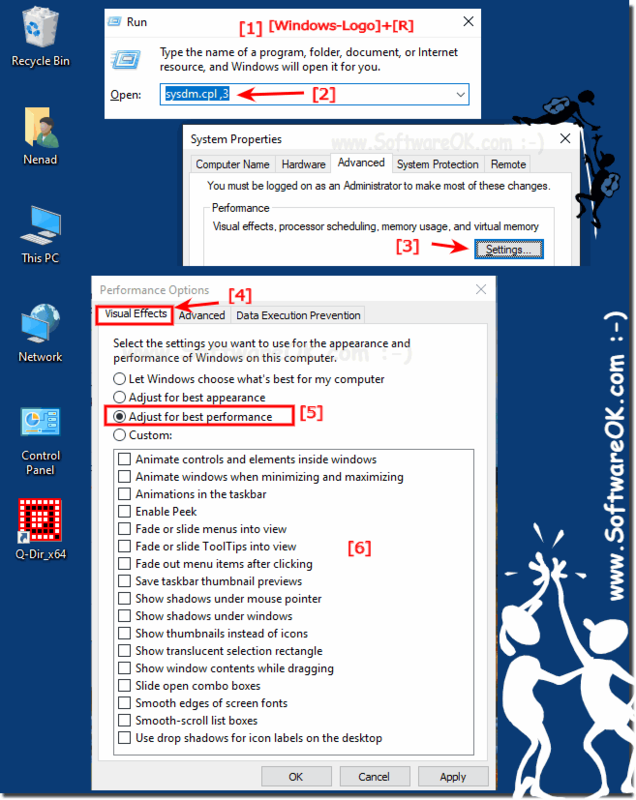 How to change windows for best performance on windowes 10? HOW TO CHANGE WINDOWS view for performance? I dont want to show shadows under mouse pointer in Windows 10, can i disable or turn off this feature? Can i disable the show shadows under windows in the Windows 10 Home? Disable the translucent selection rectangle in Windows 10, how to? Disable thumbnails and show icons in MS Explorer on Windows 10? How to disabble the Windows 10 feature in window contents while dragging? Disable Slide open combo boxes in Windows 10? Don't Save taskbar thumbnail previews in Windows 10, how to turn off?